The dominant iPad Pro 10.5 inch is an elegant device which serves you with all the features and functionalities. If you own this device, then you would always like to carry it with you wherever you go. So here we have listed some of the best iPad Pro 10.5 inch Sleeves for you. The top-rated carrying cases for iPad Pro 10.5 inch mentioned here are beautifully designed to keep your device safe while you carry it along with you either to your workplace, your college, or wherever you need. These sleeves come in a wide range of design, style, colours, fabrics, and more; making them suitable for professional use as well as casual use. These sleeves will keep your iPad secure from external impacts like bumps, drops, or falls. Select the one that would complement your style and leave an extraordinary impression! Here, we have rounded up some of the coolest iPad Pro Sleeves just for you! The iPad Pro 10.5-inch sleeves from Apple is as beautifully designed as the iPad itself. The soft microfiber linings in the sleeve protect your iPad from unwanted bumps, drops, or falls. The design is extremely classy and gives a professional touch to your iPad case. A wide range of colours available enables you to match it with your other Apple accessories. This attractive sleeve for your iPad shines the most in a crowd and differentiates it from other cases. An impressive case to keep your device in whose exterior is made up of 100% Merino Wool. This premium material is soft to touch and protects your screen from chancy scratches; it will also act as a shockproof layer. The sleeve also has an extra room for keeping your accessories inside it. All the accessories together are kept safe by two magnetic buttons which also serves the function of closure. Moreover, it is a sustainable case to carry your iPad in it. 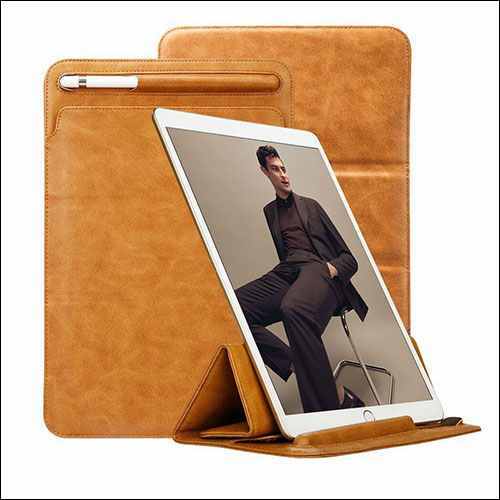 The TOOVREN trifold stand is a famous protective pouch cover for the 2018 IPad Pro 10.5”. It is also compatible with the 11” IPad Pro as the case has a size of 12*7.95 inch. It has a nice look and feels due to its all-over PU leather covering made with soft premium microfiber material, providing full protection to the IPad. It has an attachment for Apple Pencil holder that can be used for both first and second generations. Whereas the 1st gen Apple pencil will easily fit into the enclosure, the 2nd gen pencil will be a little bit short for that case. However, it will never slip out of it. The off-the-shelf kickstand position of the case holder offers you a comfortable movie-viewing and typing experience. There are six strong magnets that hold the triangular fold, which means the pencil holder will hold the entire load of the tablet. But, without any risk, it keeps your IPad Pro well in the position, be it in portrait state or landscape. For now, this protective sleeve is only available in sober brown color. However, it is perfect for your exclusive tablet as it can be a free-standing case for your every go. If you need it to use either in a coffee shop, a resto-bar, a library or even if, on a business trip, it provides you the maximum protection with a luxurious, rich feel. This case by NXLFH keeps a low profile and sheathe your iPad. The sleeve is crafted with premium PU leather and doesn’t get bulked when you slide your device into it. The soft-coated interior protects the screen from scratches and also absorbs accidental shocks from falls and hit. The sleeve is so slim and sleek gives you the advantage to slide it in easily in your briefcase or handbag. It also has an extra holder pocket for your Apple Pencil so that all your things stay in one place while you travel. The leather sleeve for iPad Pro 10.5 inch from MoKo is the perfect one to place your laptop, tablet, or iPad. It will easily slide in your bag or backpack while you go to college or to the workplace. 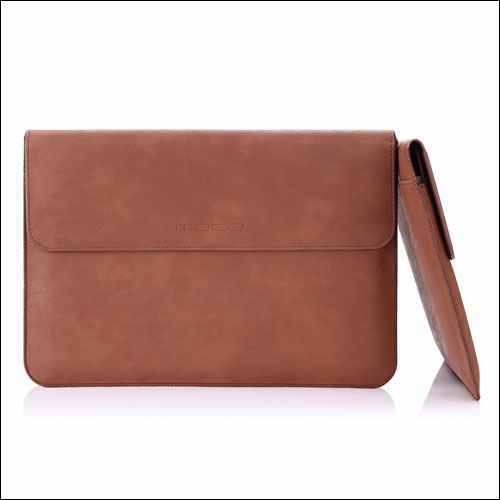 The exterior is made from hard PU leather while the interior is designed with soft PU leather to protect your iPad from unwanted scratches. This sleeve is equipped with built-in organizer slots in which you can safely place your ID cards, debit/credit cards, business cards, keys, or other important small things. The magnetic closure ensures safety to your iPad. This sleeve for iPad Pro 10.5-inch from Tomtoc can be used as a carrying case. It features two additional pockets in which you can store your stationaries and even the Apple pencil. The smallest pocket has magnetic closure so that you can easily access your smartphone or other documents kept in it. You can even place this sleeve with your iPad in your backpack while travelling. The shock absorbing pads made from soft fleece material protects your iPad from scratches, grimes, bumps, and drops. Moreover, this sleeve is compatible with all of your Apple iPads. This is a perfect case to take with you on the go! It is light in weight and also durable. Always have your accessories on hand with the pockets provided in this case. Add to your style with this colorful case while you carry it along with you wherever you go. The zipper closure of the case keeps your iPad or tablet secure. The foam padding adds a level more to the safety of your device. This universal case can fit almost all your devices. The extremely stylish iPad Pro 10.5-inch sleeve with handles from Evecase is portable enough to be carried anywhere. This carrying case is compatible with all the iPads of Pro series as well as other iPads available from Apple. The handles provided enable you to carry it easily just like a briefcase! The zippered closure ensures the safety of your iPad. Moreover, an additional pocket is provided in the front in which you can store all your accessories – be it a pen, pencil, smartphone, charging cable, or anything you need on hand. This pocket is also equipped with a zipper so that there is no fear of losing your accessories. A large and straightforward sleeve for your iPad Pro having a professional look. Its exterior has three layers of soft, anti-static material which makes your device resistant to accidental bumps and falls. The waterproof neoprene layers save the interior from sudden splashes and ensure everything inside remains dry. Other than the room allowed for iPad, you can also keep your phone and earphones in its extra side pocket. The anti-shock bubble lining in the interior keeps your iPad’s screen away from scratches. You will get multiple color options to choose from to match your identity on-the-go. ProCase brings to you the best sleeves for iPad Pro 10.5 inch. It is simple in design but is capable of meeting all your needs. Moreover, it is slim in look and portable in nature. Not to forget, it is also light in weight! You can carry it in your college bag, backpack, office bag, or suitcase while traveling. And, the interior padded surface will keep away your iPad from scratches or other damage. The zipper opening glides smoothly; enabling you to have an easy access to your laptop, tablet, or iPad. The front pocket is spacious enough to store the charging adapter, USB cable, smartphone, pen, pencil or other accessories that you might require any time. The designer sleeve bag from MoKo is a perfect fit for iPad Pro 10.5 inch. 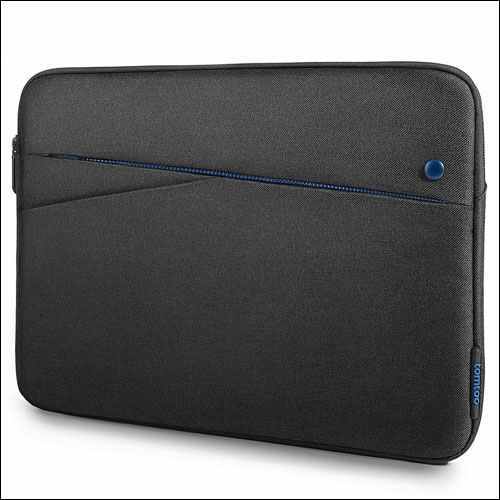 This neoprene sleeve with zipper closure keeps your iPad safe and secure. The interior part of this sleeve is made from soft padded material to protect your iPad from scratches, grimes, drops, bumps, and falls. This designer bag will add beauty to your individuality. It is available in different designs. Pick up the one that would suit your style! You can even place it in your suitcase, briefcase, bag, or backpack while travelling. For added safety of your 10.5 inch iPad Pro, you can also opt for some of the other accessories available in the market. Which one from the above-mentioned list of some of the best iPad Pro 10.5 inch Sleeves would you like to have to carry your iPad safely to your institute or workplace? Do write to us about your choices in the comments section.